What happens to a ghost when its haunt gets torn down? This is only of one the interesting questions readers will learn in this fourth book in the series of, The Haunted Library. 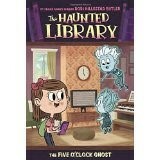 Parents or grandparents sharing these books will be reminded of Casper, the Friendly Ghost, as these ghosts and their “solid” friend go about solving mysteries together. This particular mystery includes texting on phones by the teen-agers and operating an amateur radio by an elderly ham operator. Red herring clues will tantalize young readers as they try to predict the outcome. Second grade readers and third grade readers will enjoy the story independently in most cases while first grade readers would love to have it read aloud to them. All the basic literacy skills can be strengthen using this book, with the exception of specific non-fiction text skills. Children will have a great time getting to know these characters and watching as they invent and create their own ghost catching equipment. The cartoon like sketches are funny while also being helpful in understanding the story. Lots of laughs in this one. War brings many unexpected victims, including animals taken to war to do jobs humans are unable to do. In this true tale from World War I, the reader learns about a horse who went to war with her owner, Guy Haydon. She was born on a ranch in New South Wales, Australia. 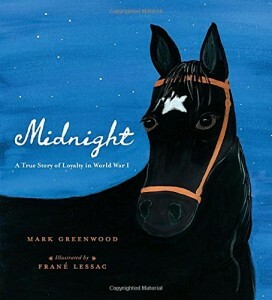 Of course, horses can’t go to all the places where battles rage, so Midnight was separated from her master for a time during the battle of Gallipoli. When they were reunited, they helped lead the Beersheba charge, part of the campaign to take Jerusalem from the Ottoman Empire. When both Midnight and Guy go down from a single bullet, they stay together until help comes. Lessac’s lively and colorful illustrations add to the story and help give the feeling of being there. First grade readers will learn about World War I, ranches in Australia, and the jobs that horses do. 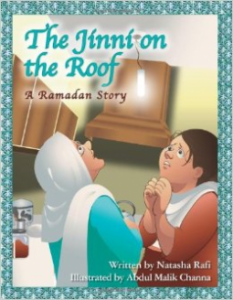 The book is a candidate for reading aloud to generate further discussion. Literacy skills will be enhanced when kids want to find out what happened to Midnight. The author includes notes about the Haydon ranch and about the charge at Beersheba for further learning. Sunscreen, lunch, books, umbrellas, yep, planning for a beach day takes lots of preparation as readers will see in this new adventure about Caterina and Leo. This contemporary, realistic story clearly shows how people go to the beach with differing expectations. Caterina has lots of plans. Poor Leo, only has one strong desire, to see a whale. Colorful, busy illustrations provide plenty of clues for readers about what kinds of things to pack for a day at the beach while also providing lots of laughs. While Caterina is busy getting situated, making lunch and later building a sand castle, Leo keeps looking and looking for his whale. He even heads off on his own to search. The scant text is engaging and independently readable for grade two readers, however, younger children will love to have this book read aloud over and over. One particular literacy skill strengthened in this book is picture clues. Core curriculum standards will be met for elementary grades studying seasons, and the geography of the coastlines of the world. 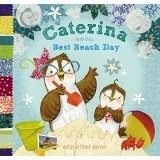 Spending time with Caterina and Leo will leave a smile on a reader’s face and a daydream about days at the beach.